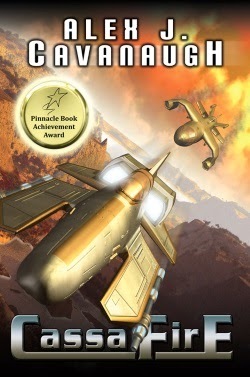 Author Alex J. Cavanaugh alerted me that CASSAFIRE, one of the books in his Cassa space opera series might appeal to sci-fi romance readers, so I invited him aboard to share some information with us! Based on my reading of the first few chapters (which focuses on the main protagonist and setting up the story) and my email exchange with the author, I'd characterize CASSAFIRE as romantic SF. At any rate, peruse the information to discover if CASSAFIRE is up your alley! Stand alone or best read in order? Second in the Cassa trilogy (CASSASTAR; CASSAFIRE; CASSASTORM), but stands alone. Aware he needed to assist Athee with her harness, Byron stepped away from the door. Unable to locate her, he frowned. The other two passengers were secure in their seats and gave no indication as to her whereabouts. Alarmed, Byron peered into the cockpit. Athee sat in the co-pilot’s seat, her harness in place and eyes scanning the control panel. Concerned, he entered the cockpit. She looked up and smiled. CASSAFIRE is available at Barnes & Noble and Amazon. ALEX J. CAVANAUGH works in web design and graphics. He's experienced in technical editing and worked with an adult literacy program. A fan of all things science fiction, his interests range from books and movies to music and games. Online he is Ninja Captain Alex and founder of the Insecure Writer's Support Group and website.